I’m not one for casinos—if I have spare cash, or if I’m lucky enough that someone hands me spare cash, I’m not taking it to the blackjack table. I’m going to the nearest boutique and buying a cute dress or pair of shoes. It was through this lens that I stood observing my new beau lose quite a bit of money at the tables at MGM National Harbor, mentally calculating each stack of lost chips as a new Tory Burch handbag or that pair of Kate Spade espadrilles I’d been eyeing. 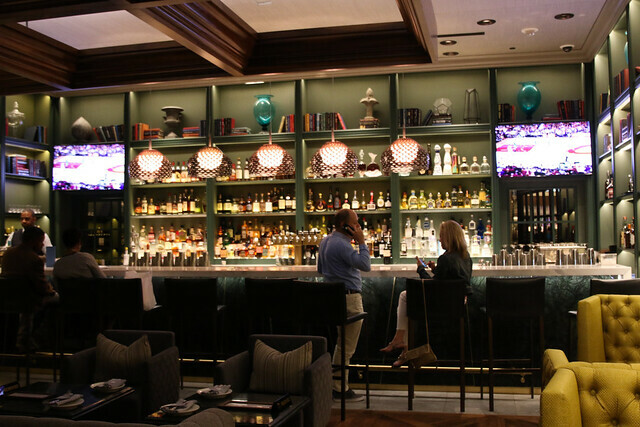 This was the not-so-lucky conclusion to quite a lucky weekend getaway—we’d stolen away for a night to the newest MGM resort, just a stone’s throw outside Washington adjacent to National Harbor. We both work, travel for work, and play for work, a heck of a lot, so I’ve made it my mission to carve out time for us to decompress and to spend time together. MGM National Harbor is jaw-dropping, in the way that big box, ostentatious places that cater to the masses can be. While some may go for the gambling, or the incredible new theater, I sought to visit for two reasons: to try the incredible restaurants from big-name chefs, and to sleep in enormous bed, with zero light and lots of amenities, for about 12 hours thereafter. We all have our hobbies. That’s the thing about casinos: the service is over the top. “Care for champagne with your check in?” Check. And the amenities excessive: “Need more booze and more food? Join us in the VIP lounge!” People of all shapes and sizes visit casinos for various reasons—money, booze, girls, usually—and get the royal treatment, and that’s what makes it fun. 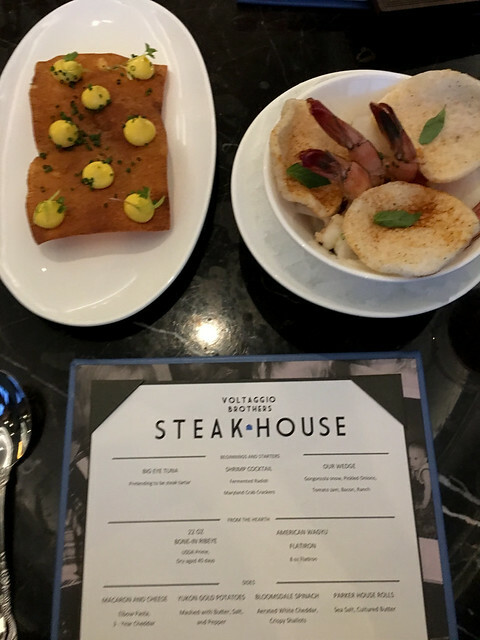 There are several incredible restaurants at MGM, but we began our stay with an incredible dinner at the Voltaggio brothers’ new steakhouse, and concluded with breakfast at Marcus Samuelsson’s Marcus. From my experiences at Vegas Food & Wine, I’ve noted that the big chefs tend to have namesake restaurants at casinos. Easy to market, easy to remember. 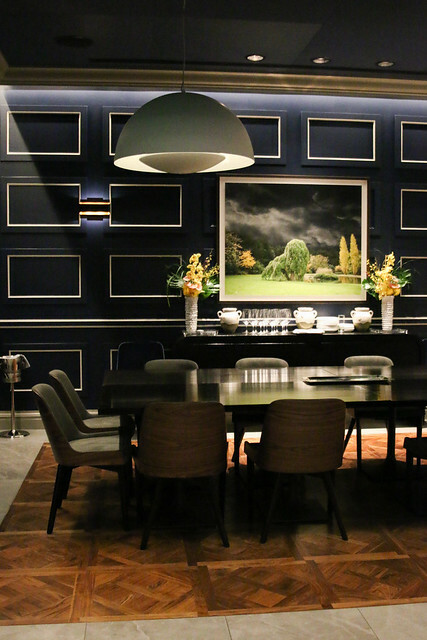 Voltaggio Brothers Steakhouse was stunning: a beautifully decorated, multi-room concept, with each space inspired by a room in the brothers’ childhood Maryland home. There’s a bright, floral, cozy kitchen. 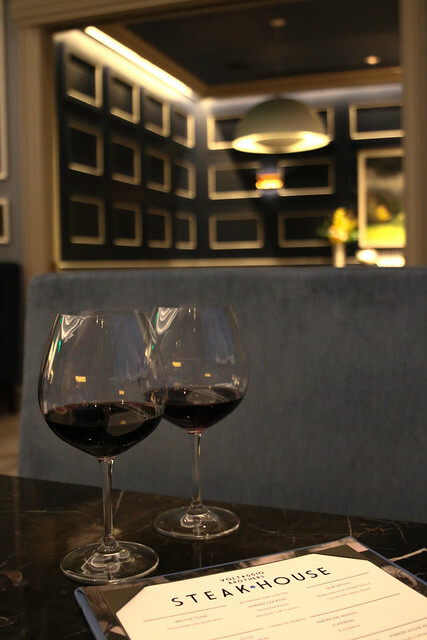 Meanwhile, we were seated in the sleek, classic, living room, with navy-and-white walls, classic framed art, marble tables, and cozy leather booths. We were seated facing away from the windows, which looked out onto the beautiful, green grounds outside the casino. 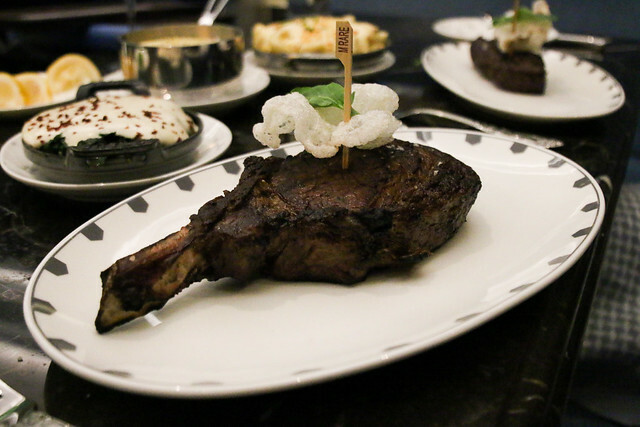 Like the space, the menu is that of a classic steakhouse: various decadent cuts of meat, along with all of the starchy sides. There’s an offering of seafood and salads to start. 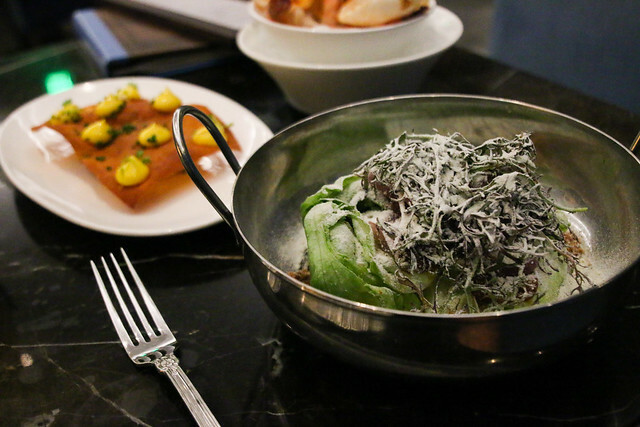 I’ve got no problem with classic when it’s well-executed, and it certainly was at Voltaggio Brothers. We began with red wine and Pellegrino, two of my three essential beverages. I had a deep, earthy Rioja while the beau enjoyed his lighter California Pinot Noir but switched to something heavier as the steaks arrived. For starters, we shared a classic shrimp cocktail, a tuna tartare, and a wedge salad. The shrimp cocktail was good: the shrimp were enormous and fresh, and the cocktail sauce had a unique flavor. But, it was overshadowed by the tartare and the wedge. The tuna tartare was beautifully presented, topped with a crispy cracker and dollops of a yellow aioli. The chunks of fresh tuna were packed with flavor. I don’t normally love a wedge salad, but I couldn’t stop eating this one, which was a total surprise. The dish was presented beautifully, and it was the perfect complement to the appetizers. The crispy Bibb lettuce was topped with a creamy dressing and tiny bacon crisps, coming together for an incredible marriage of textures and flavors. Next, we ordered a Wagyu and ribeye steak—hers and his, respectively. 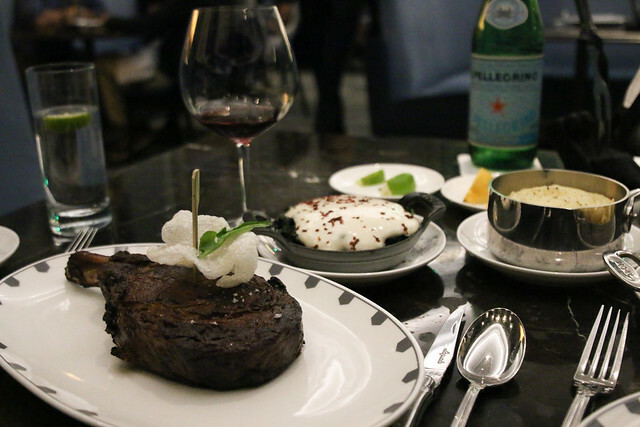 Both cooked medium rare, the Wagyu was moist and tender, while the ribeye was enormous, fatty, and juicy. We hacked away at both until we could hardly move. Along with the steaks came the proverbial parade of starches: mashed potatoes, dinner rolls, mac n’ cheese, and creamed spinach. 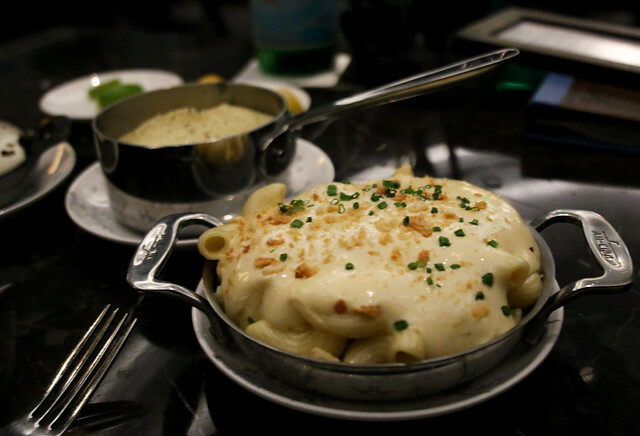 The mashed potatoes were divine, as was the mac n’ cheese. The dinner rolls, which were excessive at this point, were the classic, round kind you get as a kid, topped with a bit of butter and sea salt, and served in a skillet. 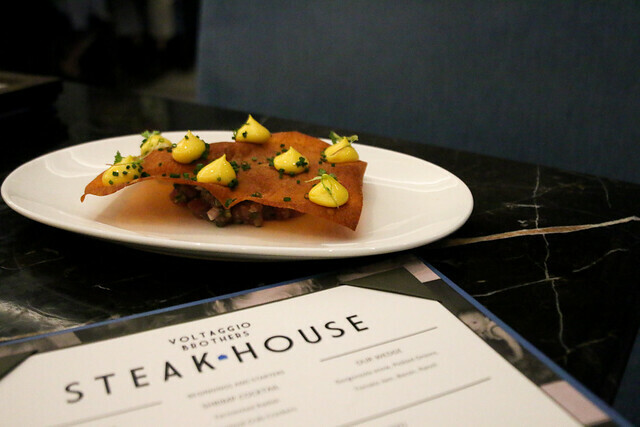 Voltaggio Brothers managed to recreate the feelings of middle class American dinners—dinner rolls and creamed spinach—in an elevated, gourmand fashion, in a stunning, classy space in a casino. Bravo. I polished off the majority of the ribeye—as I never back down from a challenge, much less one that involves the consumption of meat. Then came the dessert. 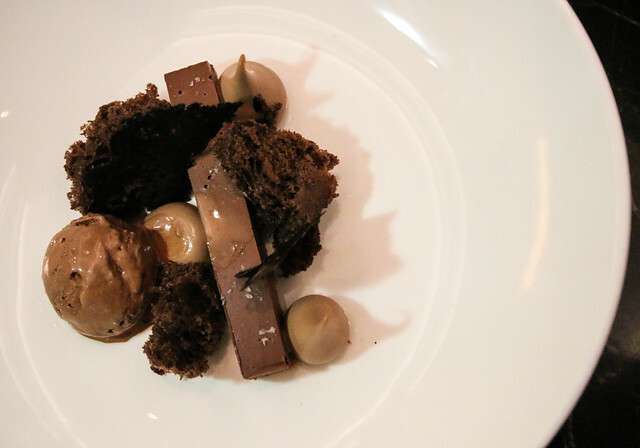 The “chocolate chocolate” had more than two types of chocolate, with a chocolate mousse, chocolate foam, chocolate cake, and a caramel Kit Kat style bar all in one dish. It was decadent. 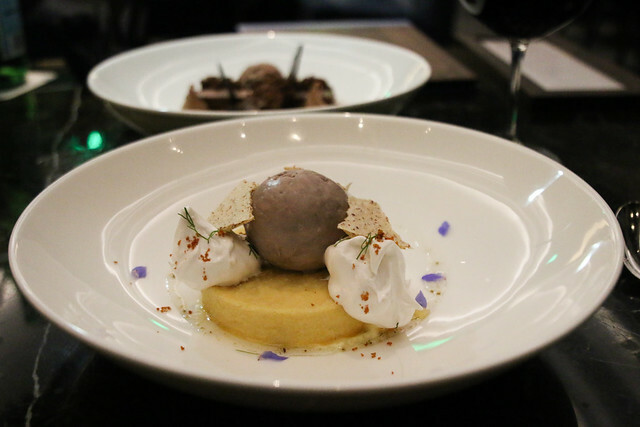 The lemon upside down cake was beautifully plated and topped with a globe of lavender ice cream. It has the gelée texture, and a thin, crispy exterior that tasted like nothing I’ve ever experienced. After an incredibly memorable evening we were off to cocktails at Blossom, located in the casino, and to the tables. We retired to our expansive suite, which was loaded with everything you might ever need, from Nespresso machines and fish bowls on the television to the vanity-style lighting and dual heads and sauna capabilities of the shower. Naturally, I most appreciated the black-out curtains and incredible air conditioning that allows me to sleep for hours on end. The next morning, we meandered down to breakfast at Marcus. You can read that review here.